HYDERABAD, India — Just weeks before elections in Hyderabad, the capital of the southern Indian state of Andhra Pradesh, a would-be candidate sat at a wooden desk in his modest campaign headquarters, unsure which party would give him a ticket to run for a seat in the state assembly. Feroz Khan, a well-built man with a clipped goatee and prominent nose, was not worried. So far, in the name of his campaign, he has suffered five bullet wounds in a politics-fueled street fight, the loss of two of his colleagues to illicit crime, and substantial financial setbacks. 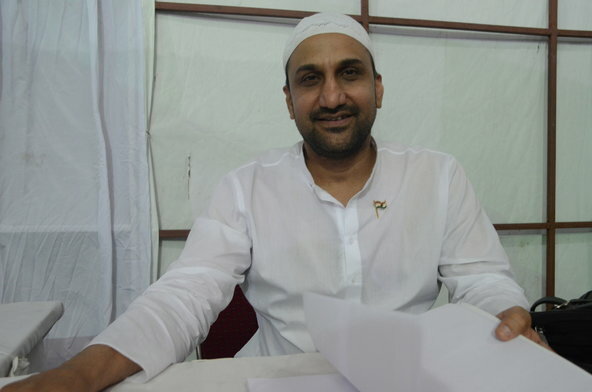 As he geared up for his second attempt to secure a seat in the state legislative assembly, the 41-year-old said nothing could stop him from becoming the assembly representative of Nampally, a mostly working-class neighborhood of more than 270,000 people near the oldest part of Hyderabad, which voted for members of Parliament and the state assembly last week. With the sting of a 2009 loss still fresh in his mind, Mr. Khan spent the last two years building support in his constituency: supplying three water tankers to the area at a cost of $200,000 per year, handing out books and bags for school, and setting up computer centers to train women in the area for better jobs. He said he paid from his own pocket with the money he earned from selling family land. With this track record, he said the party he belonged to was irrelevant. Nampally, his intended constituency, is a messy puzzle of small neighborhoods, alleyways and slums, dotted with mosques and halal shops. For the past several elections, the heavily Muslim area has supported the Majlis-e-Ittehadul Muslimeen, or M.I.M., a Muslim party that fields minority candidates and dominates in most of Hyderabad’s Old City. Mr. Khan’s supporters say the area is ready for a shift in power, predicting that Mr. Khan will win after losing by less than 2 percent of the votes during his last run. On a recent visit, the waiting room in Mr. Khan’s office was filled with people from predominantly poor neighborhoods in and around Nampally. Women, many clad in a black niqab, which leaves only their eyes exposed, sat on benches at the doorway, often bouncing babies on their lap. Men filled the plastic chairs in another section of the office, chatting loudly about local politics and gas prices. Ms. Sangeeta, who works as a cook for a family in the city, had brought along a file of her daughter’s CT scans from the doctor’s office. The 20-year-old needed an operation, she said, that would cost $330 at a local hospital. On a salary of $120 per month, it didn’t seem possible without some help. As she waited in the lobby, massaging her swollen feet, Mr. Khan was in his office, listening to a stream of similar requests. His cadre of four or five men, including his brother Rashid, was on standby to run errands, deliver news and direct endless cups of chai to the waiting room. Parents came in to Mr. Khan’s office to ask for help paying school fees and medicine bills. A man said an agency had cheated him out a job and asked Mr. Khan to put pressure on them to return a recruitment fee. And a 20-something man came to drop off a wedding invitation, insisting that Mr. Khan bless his marriage. Nobody left without a gift. Mr. Khan spent the morning fishing out anywhere from 500 to 3,000 rupees from a black leather briefcase on his desk — a practice he said was a gesture, not a bribe. Corruption, Mr. Khan said, was inevitable in this political system. But he repeatedly promised his supporters that any money he received through his efforts, clean or dirty, would go toward helping the poor — and that his wife would never wear diamonds. Later that week, Mr. Khan announced that he would be getting a ticket from Telangana Rashtra Samithi, a party aligned with the Indian National Congress, which leads the governing coalition in New Delhi. But just days later, he switched allegiances after receiving an endorsement from the opposition Telugu Desam Party. For Mr. Khan, winning Nampally and usurping the M.I.M.’s power is an ideological, not just political, struggle, in large part due to religion. An M.I.M. leader and member of Parliament, Asaduddin Owaisi, brushed aside that assertion. But he said the party would oppose any candidates aligned with the Bharatiya Janata Party, which has strong ties with the Telugu Desam Party, Mr. Khan’s latest party. After securing the ticket, Mr. Khan revved up his campaign for the final days before the poll on April 30. He spent his days walking through the streets of Nampally, shaking hands with his constituents and holding speeches about the future he envisions for the area.